From the Montgomery County Board of Election Website. The Election Results show that Mark Campbell was re-elected Large, Tom McMasters was elected Mayor and the School Levy did not pass. In Miami County the Mayoral race was 91 McMasters 69 Fisher, for Council at Large 80 Hamilton, Campbell 66. See the full Miami County results. 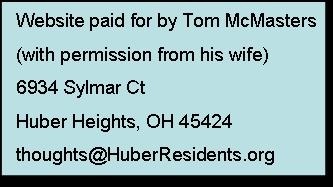 Update - here is a quote from the November 7th addition of the Dayton Daily News that help clarify the article I wrote originally. 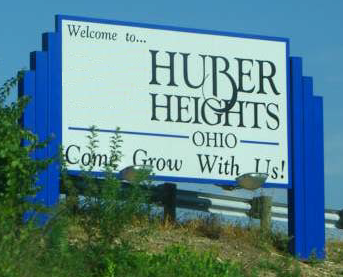 Investment group seeks less tax relief on Huber Heights units. City to take $1.7 million dollars of the school's money from just one TIF property. Updated - I re-read section (F) of ORC5709.40 and believe I misinterpreted the exemptions for the library, park and Human Services levies. This edit changed the calculation to reflect library, park and Human Services exemptions from TIF. How much do TIF Funds cost the schools? TIF funds are modified property taxes. The money in a TIF fund is money that normally would be paid to the schools, police and fire funds, libraries, parks etc. Rushmore Principle Mrs. Molfenter and Mike Baumgartner presented information on a nationally recognized parent group called Watch D.O.G.S. The event was attended by at least 50 Dads, Granddads and Uncles. With sponsorship from the Rushmore PTO this looks like a program on the way to bring more men into the schools during the school day. Council voted to authorize the $12 million contract for the Music Center Building Package on Monday. To date there has been no public discussion that shows council members have seen or understand the financial impact to the city. 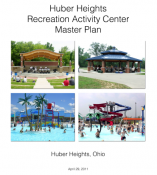 The Music Center Validation study available here at HuberResidents.org has not be published by the city and the content raises concerns about the operation and revenue expectation. I requested through FOIA the financial reports that show what council used to determine if we had enough money to pay for the Aquatic Center and the Music Center. I was given the answer to that request at the beginning of the meeting. I posted them here. Nice Job Huber Heights City Schools! I wouldn't be asking for any new levies anytime soon with these kind of grades. JMO! You can now download the Music Center Validation Study Report. I'm sitting down about two weeks before election day for the school levy and thought I would write out the reasons I see for and against the levy. School Levy Election day was Tuesday Aug 6th. The agenda and read ahead for the Jun 24th council meeting is available: The meeting contained an update to the Trash Hauling implementation. If you missed it you can watch the video available on the city's website. Trash hauling presentation starts about 4 minutes into the video. See what day your trash is being picked up. Section 1 is Monday, 2 is Tuesday etc. Save the date for this fun event. More details will be posted on the City's Facebook Page as they are announced. Sorry, I'm late posting about tonight's City Council Meeting. This will be a quick note as well. The agenda and read aheads include the city incentives to Good Sports. The full downloadable .pdf packet is also available. Citizen Comments - I wonder how many people will come and speak about the Heat Nightclub. Human Trafficking Growing At Alarming Rates! In light of the recent events that have put Ohio in the national spotlight, I would like to take a moment and share with you information about Human Trafficking that I learned at an in-service just over a year ago from Dr. Anthony Talbott an Associate Professor, Department of Political Science at UD . Though, let me make very clear that I am in NO way involved with this case and I do NOT know any facts, other than what the main stream media is putting out there. Please take a minute and look at the upcoming events for our county. Thank you! The agendas for the City Council Meeting 7pm Monday April 22, 2013 and the City Planning Commission 7pm Tuesday April 23, 2013 can be found on the city's website. I can't attend either this week because I will be in meetings for work. I appreciate your participation on our behalf. Is there a place to see jobs that are open in our Huber Heights City? It has been a while since I advocated for you to get involved in city government. I stumbled upon this and thought I might share! The first analysis of the costs associated with the Music Center Management Agreement can be found in the issues section "The Heights and the Music Center". My initial calculations using the least costly way to manage the project would have saved the city more than $120,000 per year of the projected $315,000 per year management cost.